Image caption Wikileaks founder Julian Assange says the mass release of documents reveals the truth about the Iraq conflict. Should the documents have remained confidential? 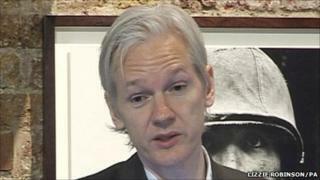 Wikileaks founder Julian Assange says the mass release of documents reveals the truth about the conflict. "The attack on the truth by war begins long before war starts, and continues long after a war ends," he said, adding that Wikileaks aims "to correct some of that attack". Wikileaks says it will not disclose where or how it obtained the documents, and that any information which could have been used to identify individuals or sources has been removed before publication. The organisation says there is no evidence that anyone came to harm as a result of a similar, albeit much smaller, release of material on the conflict in Afghanistan. But the Pentagon has nevertheless said the documents will be used by America's enemies and will endanger the lives of US personnel serving in Iraq. It says the reports are "initial, raw observations by tactical units". "They are essentially snapshots of events, both tragic and mundane, and do not tell the whole story," press secretary Geoff Morrell said in a statement. Moreover, he said, the release "does not bring new understanding" to the conflict. The US has demanded that Wikileaks hand over the files and remove them from the internet. The UK's Ministry of Defence has also criticised the release. Was the US military keeping a record of civilian deaths? The US military has in the past denied that it has a record of civilian deaths in Iraq. It says that in the heat of battle, casualty reports given by troops, known as field, are not always reliable. But the released documents show records were kept. The logs, kept and submitted by US military personnel, identify 109,000 violent deaths between 2004 and the end of 2009. These break down into 66,081 civilians, 23,984 people classed as "enemy", 15,196 members of the Iraqi security forces and 3,771 coalition troops. Some of the logs also contain the names of those who died. The Iraq Body Count (IBC) project, which has been monitoring civilian deaths throughout the conflict, still has a higher toll, and says it has documented deaths which do not appear in the field reports or are not identified as being civilians. The Guardian newspaper cites the case of US attacks against insurgents in the city of Fallujah in 2004 - IBC details between 1,226 and 1,362 such deaths during April and November of that year, while the US field reports do not list any civilian deaths. IBC believes that after cross-checking the leaked reports with its own documents, it has identified 15,000 new civilian deaths. Hamit Dardagan and John Sloboda, of IBC, wrote in the Guardian that keeping such reports and then making them available to the public was "the correct thing to do, both from a moral and a pragmatic standpoint". The BBC's Paul Reynolds says the reports appear to show that, despite official misgivings, military units are quite keen to give numbers and that these could in future be compiled by some central counting system. Was it right for US to simply pass on reports of torture and executions to the Iraqis, rather than taking action? Critics say the field reports are proof that US military personnel stood by while Iraqi troops tortured and killed civilians. The US says its troops always acted in accordance with the UN Convention Against Torture and that any evidence of abuse was passed "at the appropriate level" to the Iraqi authorities, who were then responsible for any discipline or retraining. The Iraqi government said there had been "violations" of official policy by its troops, but that the perpetrators had been punished appropriately. Correspondents say Washington is coming under pressure to say what its official policy was. The UK Ministry of Defence has said there was "no place for mistreatment of detainees" and that it would investigate any allegations made against British troops. The MoD said it had set up a dedicated team to investigate all alleged cases of abuse by UK service personnel in Iraq. With Iraq in political deadlock since inconclusive elections in March, the BBC's Jim Muir in Baghdad says the Wikileaks affair seems to have further envenomed the political situation, making rapid movement towards the formation of a new government even less likely. The office of Prime Minister Nouri Maliki - who is backed by the country's main Shia coalition, the National Alliance - suggested the leaks were launched or being exploited to undermine his attempt to form that government. Many of the alleged abuses occurred during the government of Mr Maliki. Many of his critics accuse him of representing Shia sectarian interests. The Sunni-backed Iraqiya bloc of the former prime minister, Iyad Allawi, clearly hopes the leaks might strengthen his hand. Iraqiya narrowly won the most seats in the general election and Mr Allawi is demanding a 50-50 division of power as the price for joining a government including Mr Maliki. It seems unlikely the leaks will produce more pressure from ordinary Iraqis on Mr Maliki to reach a compromise with his political rivals. As our Baghdad correspondent says, Iraqis do not seem to be unduly impressed by the Wikileaks deluge and the alleged links to deaths squads, which had previously been reported. The toppling of Saddam Hussein led to him being tried and hanged for his brutal treatment of some of his own people. It also allowed elections to be held. That gave the Shia majority, which had been dominated under Saddam by the Sunni minority, access to power. But it also led to a bloody insurgency involving the Sunnis, which left tens of thousands dead. The conflict descended into near sectarian warfare when Shia militant groups struck back with a campaign of kidnappings and killings. And, according to Britain's Guardian newspaper, that has left a legacy of torture, summary executions and war crimes. Iraq is a country where abuses of prisoners and opponents are widely believed by its people to be happening, as they were in Saddam's time. The BBC's defence and security correspondent, Nick Childs, says the leaks raise new questions about the behaviour of the new Iraqi security forces, and about the US military's approach to them.